What an excellent contrast between the one large ring and the many small circles. I’m with you in liking the bluish tone. Thanks, Steve. 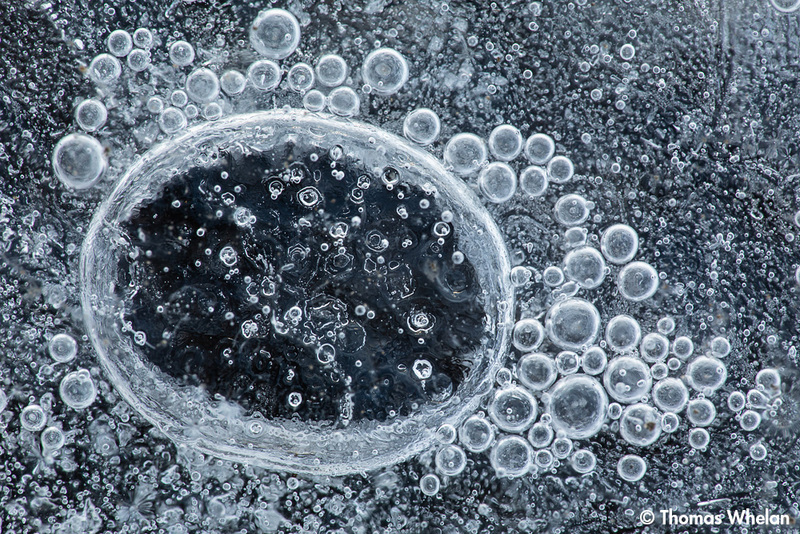 The contrast of the bright bubbles and the dark ice is what caught my eye. I’ve been so taken with the blues that you and Steve have been finding in your ice. This is especially nice; I like the dark tones. My first impression was of a petri dish. Who knows what might be growing there? The blues are reflected light from the sky. Sometimes the blue hue is overwhelming, sometimes subtle, and sometimes the hues are neutral, naturally black and white. Nice. Hundreds or thousands of bubbles in their own mini-galaxy. I’ve not had much luck finding bubbles this year. Most of the ice I’ve come across has been a viscous white (most likely made so by a billion trapped little air bubbles) and not very photogenic.